Imagine the joy on that summer day in 1993, when further's debut Griptape landed in my lap courtesy of the music director of the college station that I dj'd at, WBNY. I say joy because by then the Lou Barlow-free Dino Jr just wasn't cutting it for me. As anyone who has experienced further's scattershot first two albums, Griptape and Sometimes Chimes (both released by the micro-indie label, Christmas) it was clear that these saviors of indie-rawk were here to replenish the Barlow-void in the most lo-fi, and feedback friendly-way possible. 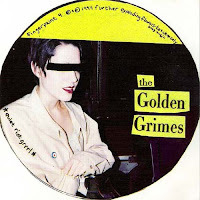 The Grimes Golden, or if you wish Golden Grimes ep followed the aforementioned albums in 1994. There was plenty of further singles and extended-players that preceded Grimes, but this one made it's way onto CD, which of course translated into convenience and accessibility. Stating the obvious I suppose, but it wasn't until this ep that further really embraced the whole splice and dice, cut and paste eccentrism of a certain band named seBADoh. This ep was the weirdest offering from the further oeuvre at that time, but along with that weirdness came bona fide melodic sensibilities, manifested in songs like "Quiet Riot Grrrl," and "California Bummer." This nine-song collection, in my opinion, is the most memorable and concise record they ever made. As for a back story, further prime-movers Darren and Brent Rademaker had a stint in Shadowland, a major label outfit that was long on corporate pandering, and low on credibility. More info on further can be found here and here. Brent Rademaker and future further member Chris Gunst would later go onto Beachwood Sparks and The Tyde, but nobody in the world is familiar with those bands, right? BTW does anyone have the further "Surfing Pointers" 7" or any of the other Christmas records singles? i have just dug out griptape, grimes golden,sometimes chimes and the 10?trak 2 x 7 inch on lissy`s. Oh, yeah. Its all still quite romantic, murky and magical.Gimme indie rock.shauny_66@hotmail.com. ah, golden grimes. i picked it up after hearing a further song on a comp. it was 1994 and i was a young an impressionable high school sophomore. as soon as the drums kicked in on california bummer, i was hooked. it became my anthem that summer as i drove around imagining i was living in california instead of northern virginia. i go back to that album every spring when the warm air starts to lift my spirits and it takes me back to that glorious summer when i was wearing torn sweaters and washing my hair with soap. Much obliged for the reup!